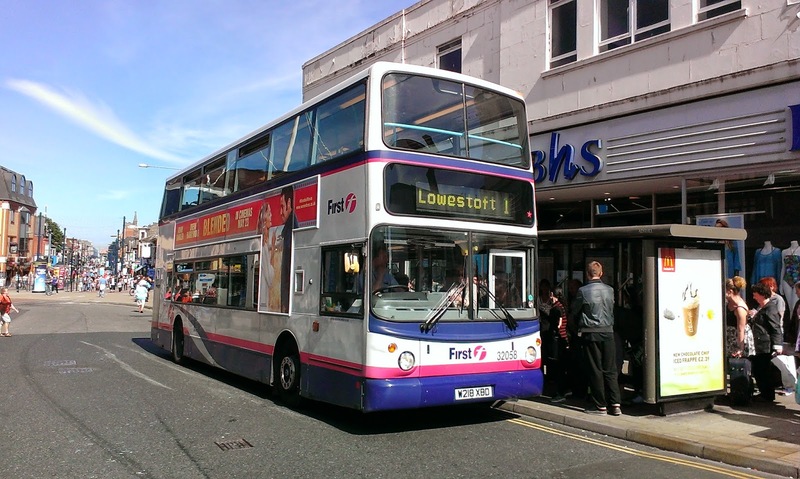 I am delighted to include the North West Bus Blog in my links section. Covering Merseyside and Manchester, as well as contributors from other regions, it will be of interest to those of us who want to know what's coming our way in 10 years time! I'm delighted to have Tom Harrison, the blog founder as a follower on Twitter, and I'm looking forward to sharing snippets of news with him. I like the layout of his blog, and the "about us" page is really worth a look - extremely well worded. The link to NWBB is in the "Other Enthisiast Sites" section down the right hand side of the page. A couple of other blogs have been declaring how internationally read they are. Yeah, yeah whatever, I thought - how do they know that! But then I became curious and did some digging in the stats, and thought you might be interested to see where SB&TP has been read in the world this week. I certainly didn't expect Indonesia and Algeria to be on the list! We should have a FRIENDLY contest between the blogs to see who can clock up the most countries read in! Anyway here is this week's list - who else will publish theirs!!! And why am I more popular in Indonesia than Ireland! Over the last month you can also add France, Germany, Spain, and most bizarrely Moldova! Must start planning my World Tour lecturing on bus rattles! Wow!! I'm truly gobsmacked and to all those overseas thanks for reading the blog and please, please send some pics in of the buses and trains in your part of the world. It will be great to have a readers pics section. A quick yomp to Yarmouth today to pick up some shirts for my Edinburgh trip next week. To be honest I didn't spend much time at Market Gates but took a long stroll down the seafront as far as the Pleasure Beach, and I have a question. 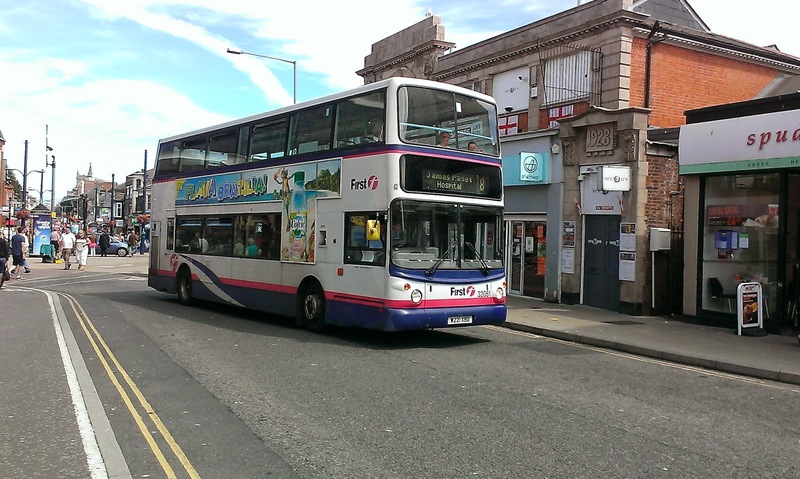 Why are there no buses running along the seafront to the Pleasure Beach? I had to ask directions to get to a stop on Barrack Estate to get back into town. Surely in the Summer months a link from the holiday parks to the Pleasure Beach is called for? An extension to the 3 maybe? Anyway by time I got back to Market Gates I had about half hour before I had to start making my way home and, once he'd finally realised I was there, Cameron from Yarmouth Bus Page informed me that not only was the freshly returned from Ipswich 32061 due on the 8's but also that ex Leicester Gemini 32629 was due on the 1A to Lowestoft, which happily was the direction I was heading in, so I got not only a pic but a ride to JPH before transferring to the 61. So as SB&TP prides itself in not just showing pics but giving reviews of the vehicles from a passenger's point of view here goes. 32629 is almost 10 years old. She doesn't feel it. Comfy seats, smooth ride, few rattles and quiet. Well almost quiet. that dratted fan was on almost constantly so 30888 may have gone (last heard over the pits at Ipswich having work carried out on the engine) but it has a replacement to tickle the ear drums of the good people of Yarmouth! However apart from that I was highly impressed with the Gemini, certainly a country mile better than the ALX400's, a different galaxy to the Presidents and again proof that Wright are amongst the best body builders going. Having said all that I then got on Anglian 101, my first gas bus for a couple of weeks, and it was like snuggling under my favourite duvet again after a couple of weeks away. First time on 101 for a long time and it is in great condition. Rather an insult to be called a bus when it is so, so superior to any of its competitors. Anyone who watches Family Guy will recognise the title of this post and will know what to expect - it's basically a rant about what is annoying me today, and I apologise if I'm breaking any of Fox's plethora of copyright laws by using it. Treat it as a compliment! Today I caught the bus from Saxmundham to Ipswich the long way round via Aldeburgh to avoid the roadworks on the A12 at Stratford St Andrew, which was causing 20 min delays yesterday. As it turned out it was a good decision as I had the comfort of 69423 instead of the bum numbing 65673. However, at Leiston the driver was involved in what can only be described as an incident with a pushchair and a foul mouthed irate mother. Due to bad parking, ignorant car drivers and the aforementioned 65673 coming the other way (why ARE the 64A's timed to pass at Leiston?) 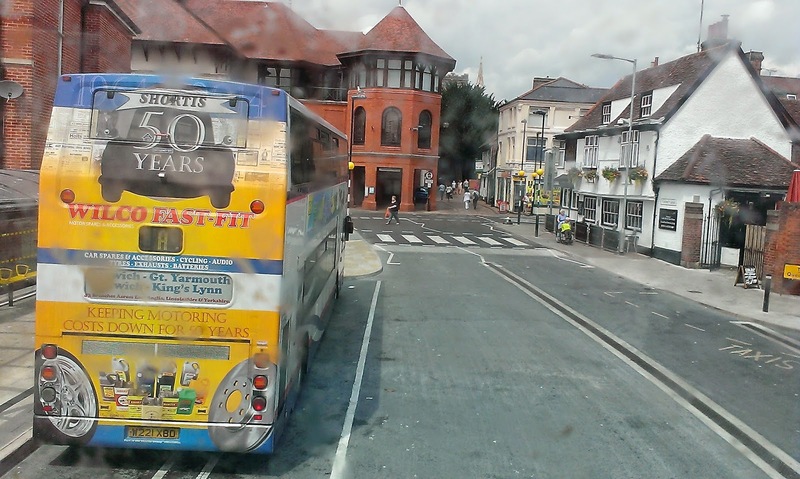 my driver had absolutely no choice but to get as far over to the nearside and mount the kerb - I say that as a former London driver - or the crossroads would have been totally blocked. I had seen the lady with the pushchair and another child come round the corner. So had my driver. 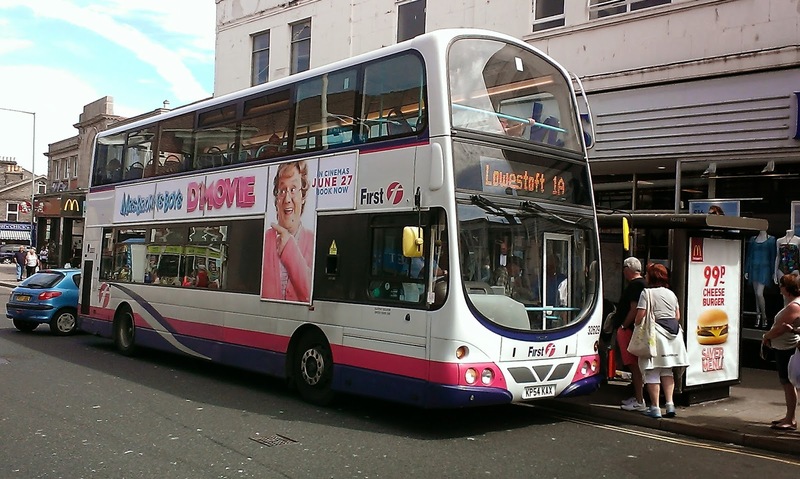 However the lady in question had not seen a bloody great lilac bus. My driver followed the lady, and when she finally realised the bus was behind her on the pavement the bus was stationary. To say the reaction was hysterical is an understatement. A torrent of foul mouthed abuse was aimed at the driver, claims that he was going to kill her baby and so on. A couple of guys from the adjacent cafe heard the commotion, and started on the driver too, one dashing in to grab a camera. Just what anyone can do with a stationary bus with the handbrake on I have no idea, but as we continued to Aldeburgh I remembered something about my own driving days. When I was a driver if there was a public complaint the driver was automatically guilty until proved innocent. After all why would someone complain if it wasn't true. Incidentally the complete opposite applied on the railway but I digress. So on arrival at Aldeburgh I gave the driver my card and told him I would be a witness. I thought for a long time before writing this post as I try to avoid talking about individuals, but realised I'm defending not criticisng. So the next time your driver is a bit stressed or a little grumpy give them a break. Of course we know there are some that are always like that and I'm not talking about them. The abuse that drivers have to put up with on a daily basis must make staying cheerful impossible - I know it is from experience and in this particular case I can assure First Ipswich management that your driver this morning was wholly in the right, did not return any of the abuse he received, and I found his driving and attitude exemplary for the 2 hours I was on his bus. There are times I think pedestrians, especially those with pushchairs need a licence themselves. How someone can fail to notice over 3,000 cubic feet of brightly painted metal up her backside defeats me completely. And that's what grinds my gears tonight! Had a flying visit to Ipswich today to get tomatoes - yes I kid you not I don't know anywhere else that does the sweet cherry plum tomatoes that Ipswich market does - just gorgeous!! 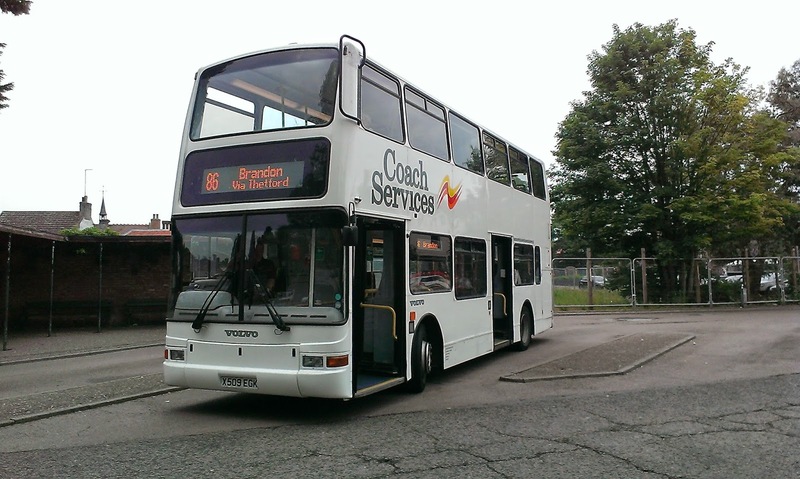 Anyway although not much time for any spotting I did see Volvo B10ble 66112 which is only at Ipswich for a few days. I was also surprised to see Yarmouth's B7tl 32061 there, when we were told last week it was going back to be replaced by 30888. Nothing else of interest to report, except Ipswich Buses had a former 4 branded Dart on the 98 to Shotley, which is usually Solo operated. Cameron Robinson over at Yarmouth Bus Page has been the sharp eyed eagle today. He spotted Lowestoft's ex Yarmouth Gemini 37562 back on Yarmouth workings today. Quite what it is doing back at Yarmouth is anyone's guess but obviously wasn't on the 99's today! 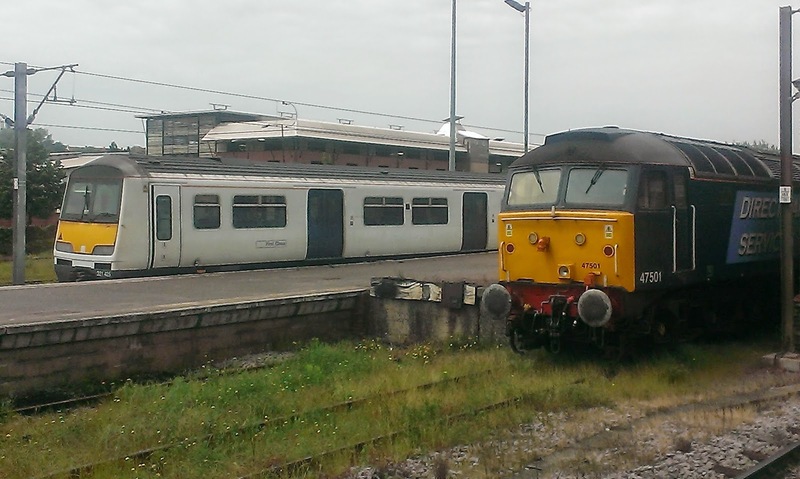 Update: East Norfolk Bus Blog report 37562 is back at Yarmouth prior to a surprise transfer to Norwich. 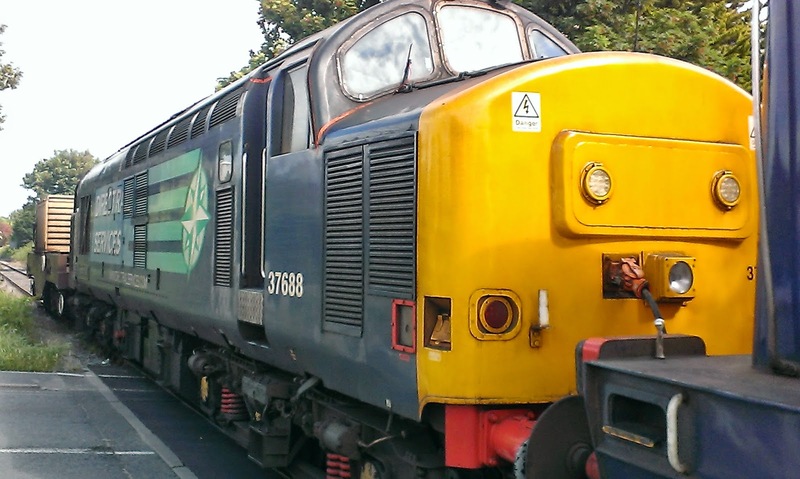 In its place 37572 has transfered to Lowestoft on a permanent basis. 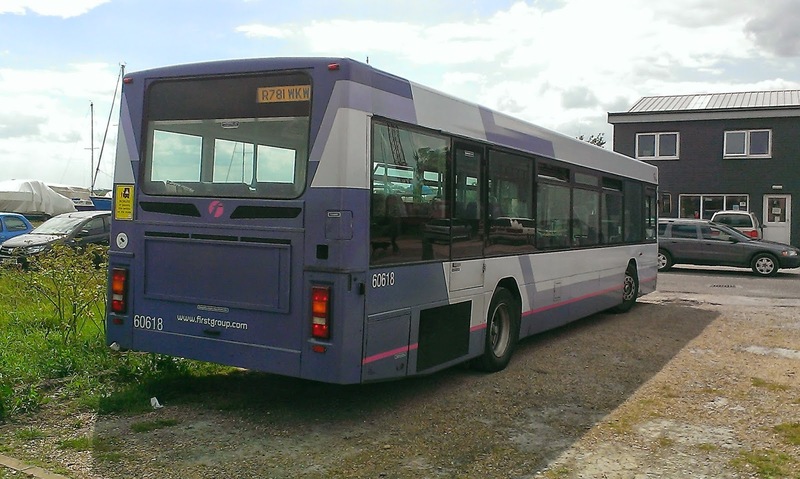 Another scoop by Cameron was the first report and pic of a new arrival at Yarmouth.of ex First Leicester Volvo B7 Gemini 32629 KP54 KAX. Cameron has kindly given me permission to use his pics and I urge you all to check out his posts and reports by clicking here. This is basically just an excuse to post the pic I took this morning in Saxmundham, but there is a lot of fleet activity at Ipswich right now, which is going to be the case for the next 3 months or so. 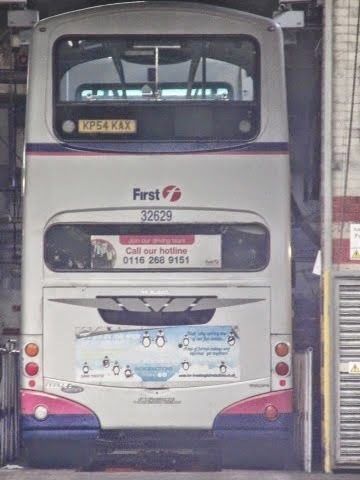 Vehicles currently away for refurbishment and repaint are B7tl 32479, which will come back in Eastern National Post Office red livery, Volvo B7rle's 69008/9, 66850/981 and ex Clacton E200 44519. On loan long term are Volvo Saloons 60618 and 62143 and for this week only 60622 and 66112. 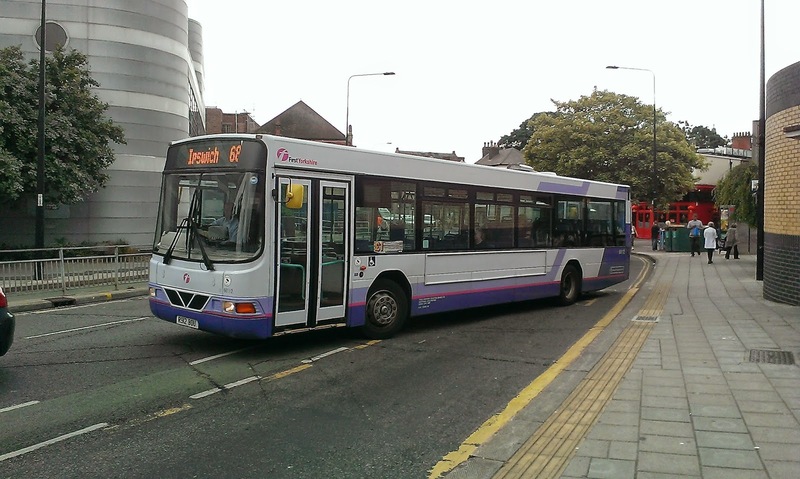 Volvo B7tl 30888 was meant to replace 32061 but I have not heard that confirmed yet. 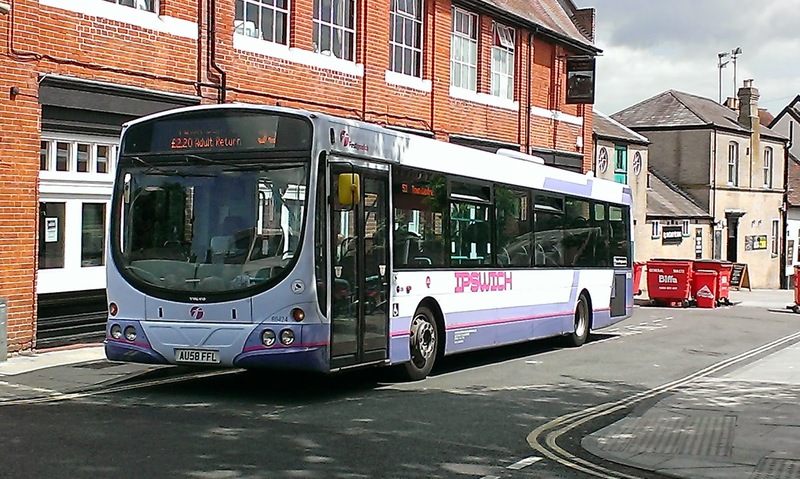 Ipswich are hoping for two vehicles to return on Thursday next week, if not the following Tuesday, so anticipation is high to see what liveries they turn up in. SB&TP has just passed the 50,000 views milestone, and if anyone had told me when I started this from scratch just 240 days ago that it would take off the way it has I might have felt too intimidated to carry on! Without making this an Oscar acceptance type speech I must thank a few people - Cameron from Yarmouth Bus Page and Sam from Norwich Buses for being my inspiration for starting this, Roy from East Norfolk Bus Blog for not only giving me advice but becoming a good friend, and to everyone who has contributed pics, news, comments and those I have met in person. I can be outspoken at times - I say how I see it, and I hope I'm just as quick to praise as I am to criticse. I realise it is unusual for an enthusiast to be as critical as I can be at times, but it is also unusual for an enthusiast to cover as many miles on the very vehicles they are enthusing about as I do too. I want to give a different angle to the norm - one as a passenger, rather than just a photographer. My thanks to the operating companies for not banning me because of my views, and to Barry Spurling in particular at Ipswich for always readily giving me his time. I look forward to an exciting future in our region, and hopefully I'll be able to spread my wings a bit and cover some of Essex too if my transport probs can be sorted. Long live the Olympians, I look forward to non rattly E200/400's and here's to the next 50,000! 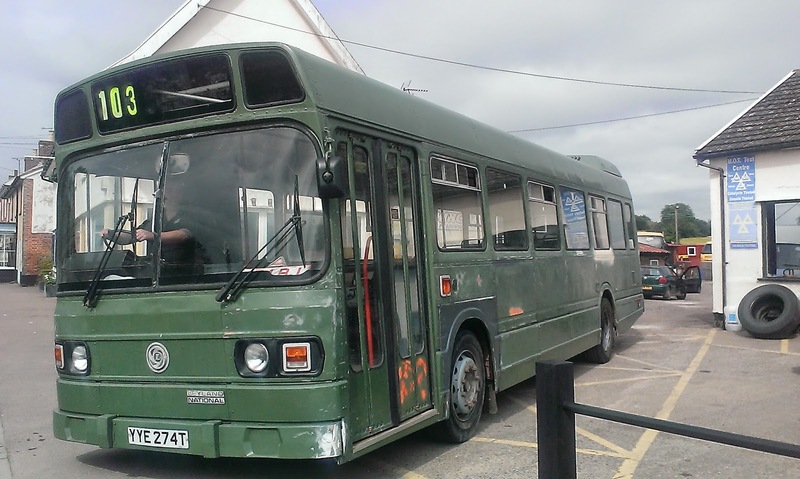 A really pleasant surprise this morning when I glanced out of my window and saw a Leyland National passing by which rather conveniently stopped outside Whincops garage where it was haing a chassis clean. YYE 274T was new to London Transport in 1979 as LS274 and was based at Edgware Garage operating the 210 between Brent Cross and Finsbury Park. It saw service in later life at Chase in Walsall and the last few years has been providing farm transport in Eastbourne. It is now in private ownership, and the current owner has asked to remain anonymous, which of course I respect. Cheers though, buddy - brightened my day up and I look forward to seeing her in her restored glory when completed. There have been a lot! However since Clive Nixon has done all the hard work on his blog detailing everything it seems a bit unfair just copying everything here, so for all your Ipswich details and some very good pics go to Clive's blog by clicking here. 2. ......Which they may now seem as a blessing in disguise as a signal meltdown between Bethnal Green and Liverpool St meant that nothing could get in or out of Liverpool St this morning and trains were being terminated and/or cancelled all over the place. 3. 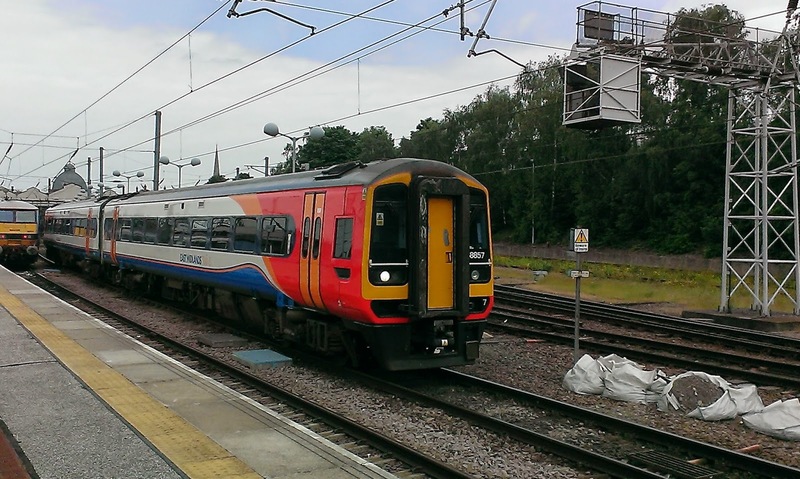 A person was hit by a train this afternoon at Weeley, causing the line between Colchester and Clacton to be closed. It has just come through that the 1500 Norwich to Liverpool St will run fast from Colchester to Liv St due to a fault on the train.So anyone wanting Chelmsford or Stratford will have to change at Colchester now. That will be good if you have taken the trouble to book tickets. 4. The last two nights the 1900 Norwich - Lowestoft and the 1955 return journey have been cancelled due to another fault - this time with the short set's new coaches and the central locking system. Now this is not a go at Greater Anglian. Well not all of it. For those who don't know about the intricacies of the Railway it basically boils down to this - if it moves it belongs to the operating company - ie Greater Anglia, so that means rolling stock and staff. If it doesn't it belongs to Network Rail - the infrastructure including tracks, signals, stations etc. Greater Anglia pay Network Rail to use the tracks. If there is a delay down to train faults then Greater Anglia pay a fine to Network Rail. If the signals go pop then Network Rail compensate Greater Anglia. There are teams of people whose sole job is to analyse delays and apportion blame. Of course there are grey areas, and yesterday's incidernt is one of them. If the pantograph on 90013 was damaged due to poor maintenance, a bolt coming loose or something that was the fault of the loco then the fine for GA will be eyewatering. If there was something wrong with the overhead power lines, be it debris placed by vandals or anything else then Network rail will foot the bill. 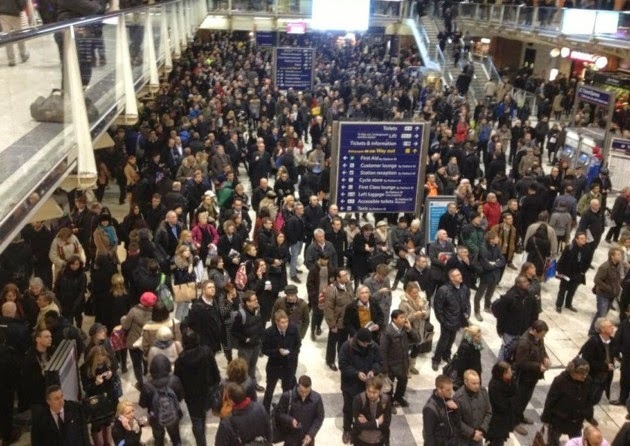 Liverpool St last night. Not a pretty picture. But whose fault it is doesn't really matter. The travelling public don't give a damn whose fault it is - they just want a hassle free journey that is both reliable and value for money. The Railways on the Anglian region is neither. We have old trains running on old tracks operating on old signalling systems. Now I spent 5 years as a Conductor in the last days of the old slam door trains in Kent, and they were more reliable than the new stock. 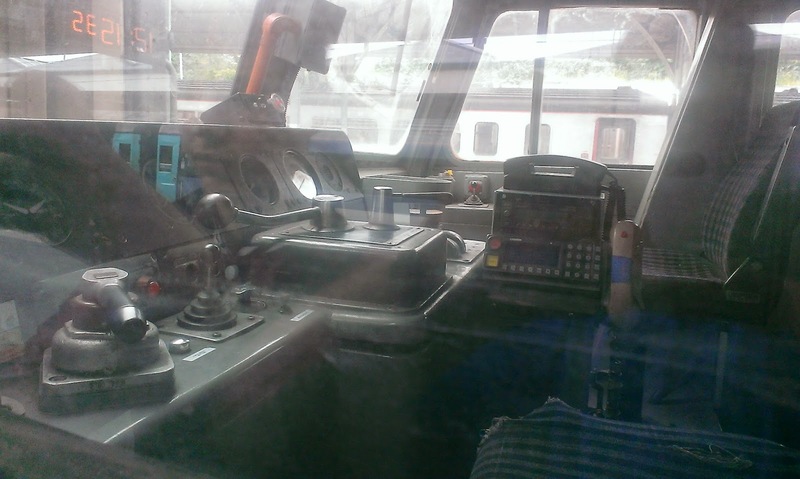 but those Class 90's on ther mainline seem to fail with monotonous regularity. It's not only GA's class 90's - the other week all but one of Freightliner's 90's were off the track too for various faults. The short set is using 40yo locos, but the last couple of nights it has been the new coaches - hired in I might add - that have been the problem, and the short set is not out today. In the last weeks we have seen bridges fail, and more signalling failures than I can remember for a very long time. Excuse me but isn't there meant to have been massive investment in signalling, overhead power lines etc? Can anyone a generation older than me remember as many failures when all signals were controlled by individual signal boxes with signals operated by cables not computers? How many level crossings got stuck (as the one at Ingatestone does all too often) when they had gates operated by men on site not a button pressed 50 miles away? I never had a slam door train taken out of service because of door failure but many sliding door trains. Just like my gripe with modern buses not being built to the same standard as the past the so-called modern railway isn't providing any noticeable signs of improvement either. As I type the 1810 Liv St - Norwich won't be an intercity set tonight, so reduced toilets and 1st class, and no catering or wifi. Will the regular passengers on that service be compensated? Not a chance. Until managers are forced to travel to work by train and have their pay docked if they are late nothing will change. The total apathy in top rail management is staggering, and it's the poor sods on the platforms, trains and call centres that take all the flack and abuse. It doesn't matter how many times the franchises change hands it's the same faceless people at the top. We have been promised change and improvements for decades. It's about time we saw it. When the rail network runs smoothly there is truly no better way to travel. Sadly it seems that even now, 14 years into the 21st century, there are far more days when it doesn't, than when it does. 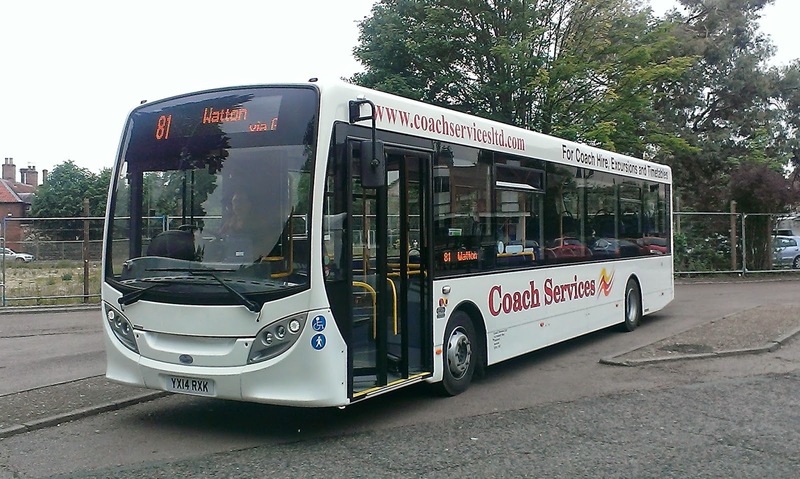 David "newsflash" Warren was seriously on the ball this morning when he reported that 3 Enviro 200's had arrived at Ipswich from Clacton last night. 45117-9 YX90 ACX/Y/DO are set for service on the 53's. There is one more due next week,which will see one of 69532/3 go the other way. 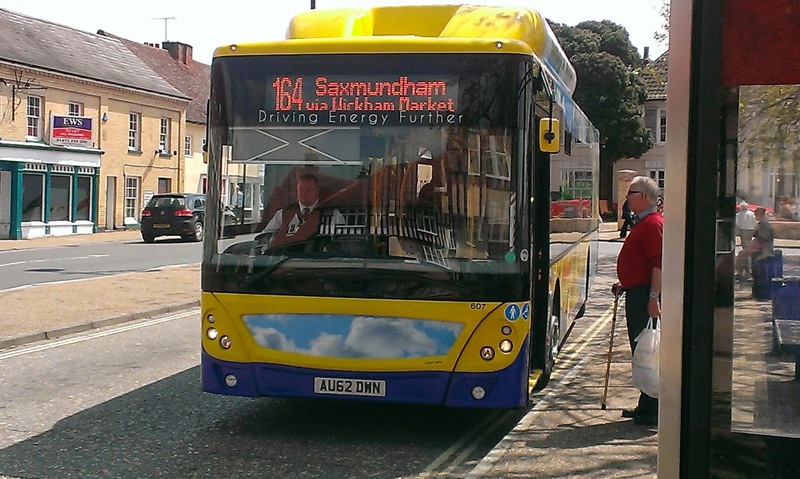 By happy chance I was in Saxmundham earlier and 69533 passed me! Already departed for Clacton are 03 reg Scania Solars 65690-2 which is quite typical as only a couple of months ago I gave 65692 a rave review saying it was the nicest First Scania I had travelled on. Anyway I can reveal the first E200 will be going away for refurbishment next week, and they should all be branded for the 53 on return. Thanks to David for the heads up and the pic below is copyright to him. 69533 PL05 UBS seen at Saxmundham could be going the other way to Clascton. Now a bit of praise for the Ipswich maintenance chappies. While killing time this morning (I challenge anyone to find something to do for 2 and a half hours in Saxmundham) I got on on loan ALX400 32061 and I don't know what they have done to it but it feels like a different bus. A vast improvement from my last journey on it. I know the guys from Rotherham praised Ipswich's fleet of ALX400's as the best in the country for their age and that expertise is showing. Well done, guys, and particularly to Barry Spurling, who has an engineering dept to be very proud of. 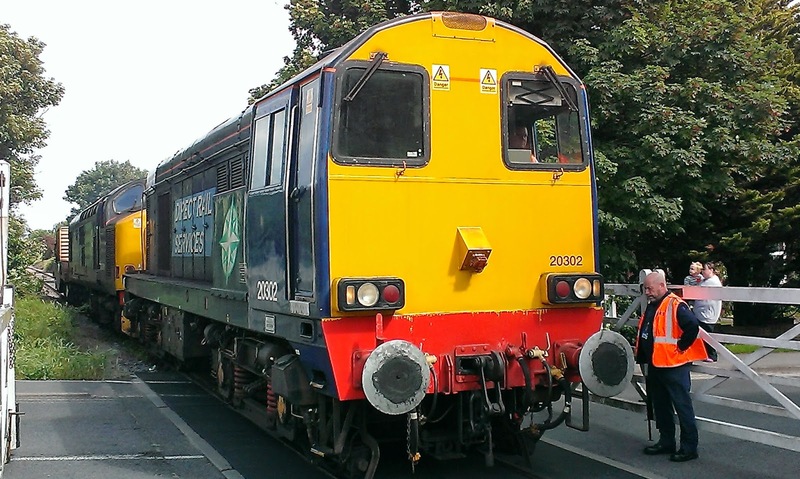 Chris Speed has just announced on Twitter that 32061 is to return to Yarmouth shortly to be replaced at Ipswich by 30888. That will make Yarmouth a much quieter place and Ipswich much noisier unless the magicians at Ipswich can work the oracle again and somehow stop that fan from being on all the time. The reason given isn't as I thought because of the Wilco ad needed back on its designated patch, but that 30888 has guide arms so can be used on the 66 if required. Two new timetables were released today, and both had been eagerly anticipated. 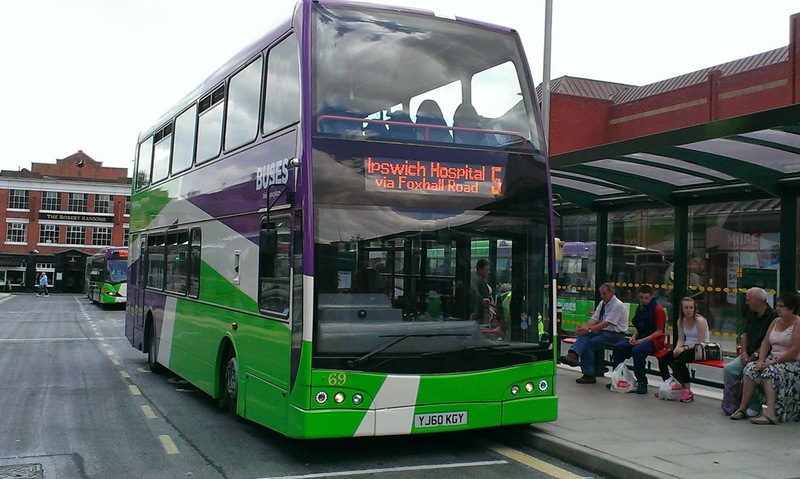 Ipswich Buses service 4, which is taking on First's 66 to Martlesham, and Borderbuses 146 from Southwold to Norwich. 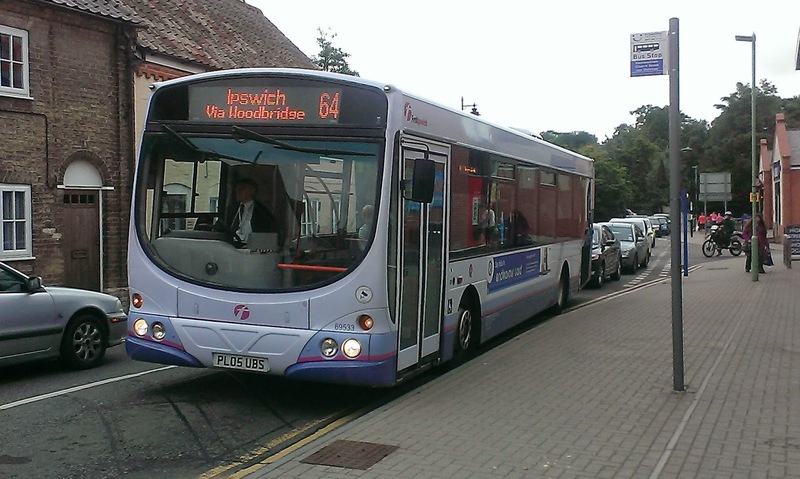 Starting with Ipswich Buses. 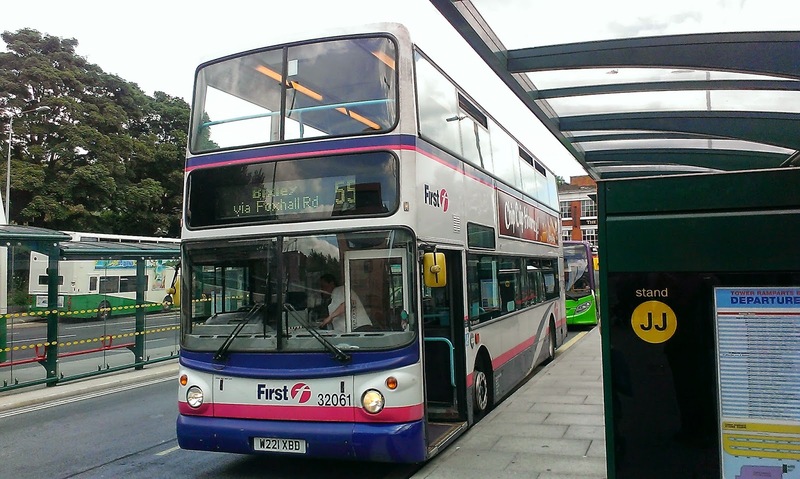 Now I have criticsed First in the past for not competing on routes shall we say with 100% enthusiasm, and I have to be consistent here and say the same applies to Ipswich Buses. Imagine the reaction of the good passengers on the 66 if you told them frequency was being reduced to half hour, start and finish times were being cut, and on top of that reduced capacity as single deckers replacing double deckers. That just about sums up the 4, which I can see being as much of a thorn in First's side as First's 99 is proving to be to Anglian in Lowestoft. 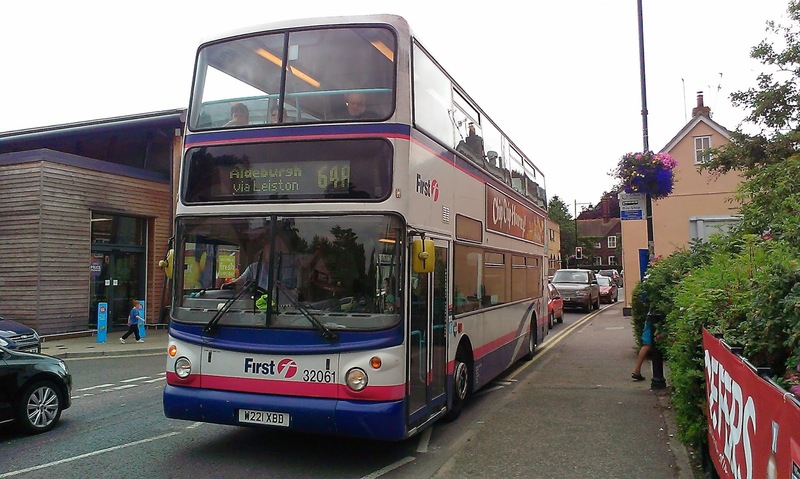 With First's 66 now extended to Halifax encroaching on IB's 7/15 surely it would have been better to extend that 20 min 7/15 service to Martlesham using the spare deckers that IB have restoring the cross town service again. Then the 4 might have been a threat to the 66. Not now. An opportunity missed. I am wondering what passengers IB are targeting with this route. When Borderbus announced the 146 I championed it, particularly as I was assured that the school Tridents were not going to be used on it. Well if they aren't I can't see why on schooldays the service is barely worth bothering with. If you are travelling from Southwold to Norwich and back on a school day your first bus is 0925 (nice timing for passes that one) getting into Norwich at 1045. Your LAST bus back is 1250. I kid you not. If you fancy going to Southwold for the day from Norwich on this faster service on a school day your first service is 1010 from Norwich arriving at Southwold at 1125. Sadly though by time you've unpacked the beach towel and pork pies it will be time to pack up again as the last bus to Norwich leaves at 1325. 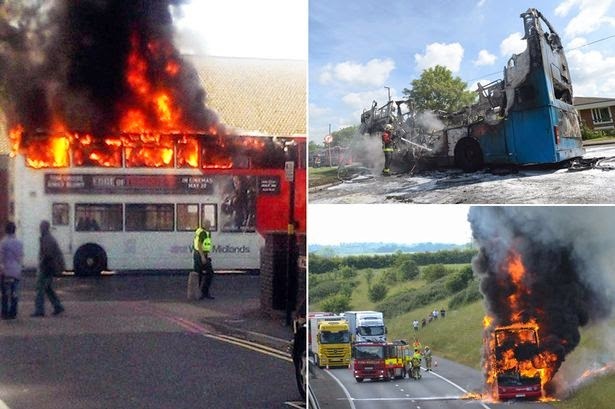 Again you have to wonder what passengers Borderbus are targeting but I'm getting a huge sense of deja vu here as the same mistakes happened with the 164. There is no point taking passengers out if you can't bring them home, and too many services are affected by school buses. It is another reason why car users just won't start getting the bus. You can see the new timetables on the suffolkonboard website by clicking here and share in my disappointment. I would suggest that no-one clicks on those links if you get such an email. I'm not going to restrict comments from those who wish to remain anonymous as I regard, unlike others, comments to be an integral part of the blog. Just be careful out there guys! Yes, Yes And Yes Again! I said yesterday there would only be one reason for a post today and it happened. I got a ride on an Atlantean. Ipswich Buses had the open topper out in normal service again and without doubt it was the best 40 mins I've spent on a bus in many a year. Oh my word that engine roaring up Grove Lane took me back 35 years and it could have been Chatham Hill in 1979 again. Unbelievable. Also rather poignant on a day when a P reg Olympian 34155 was collected from Lowestoft for scrapping, that an original P reg vehicle could be giving such pleasure. Whoever at Ipswich Buses had the brilliant idea to put that bus out in normal service I thank you from the bottom of my heart. Not just me but the smiles and comments from other passengers were a joy to see. Something certain Routemaster owners might like to take note of maybe - if not regularly then once or twice a week on a good day get them out to do a Lowestoft and back or something and watch the goodwill and tolerance levels shoot up. Also in Ipswich one of the Scania Olympus's was unusually on the 5/11 too, although by early afternoon it was back on its usual 9/10 route. First have been having problems with 65673. Today was the third day on the trot it had broken down - today at Tower Ramparts bus station which gave a decent photo opportunity as the 53's were having to take layover time parked down the side of the Robert Ransome pub, which proved to be quite a good backdrop. Finally - and I mean finally for a bit on loan Yarmouth ALX400 32061 was on town routes, which is unsual in itself. OK that's it - footy time!! A long time since my last post, for no particular reason except I need a break! So with the footy starting tomorrow I'm taking that break, and unless anything amazing happens like the whole of Norwich fleet being replaced next week I'll be staying in and only reporting news I find elsewhere (with full credit) or am kindly given. My enthusiast batteries need recharging big time! So what has happened since my last post? Well on Monday I finally met the gentleman that is Tim (Suffolk Raider) Miller in his bustling shop in Beccles. A real pleasure, Tim, we will have to make that a regular thing, and note to First Lowestoft - if the fan on 30901 can't be fixed can it be kept off the X2 as it nearly blows you away in Tim's shop!!! 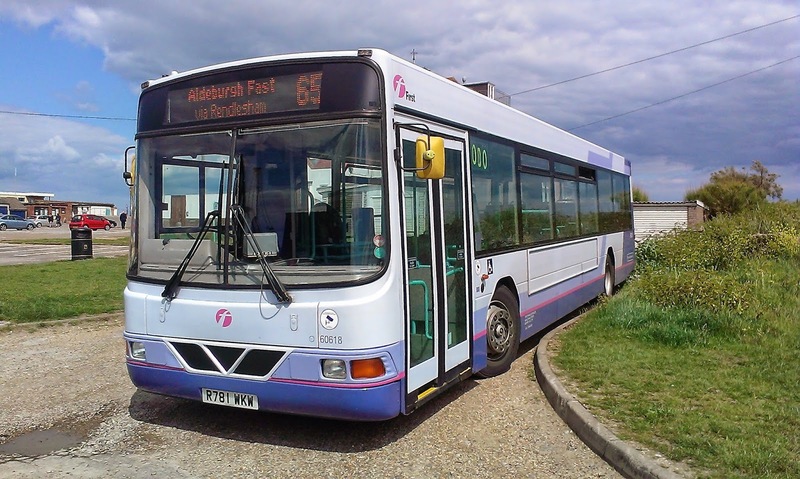 Tuesday saw me at Lowestoft in the company of one of Lowestoft's finest drivers who to avoid embarrassment shall remain nameless, but I did a couple of circuits on the 99 to see how things are progressing. That's enough about that but while at Lowestoft Bus Station between trips we did see quite an unusual working in one of Anglian's Optare Versas operating on the 60 to Beccles. The Versas are normally exclusively on the Norwich town route 53 (I think - don't correct me if I'm wrong it's 50 something) - so a rare sight to see one in Lowestoft. Obviously run out of mobile bbq's. Later on I saw 32064 in service on the 8's, but the pic I got was so awful it was deleted on the spot! I understand 32061 wasn't greeted with the greatest enthusiasm when it arrived at Ipswich the back end of last week, with a few things to be put right before it could enter service. Seemed ok the day before when I saw it in service in Yarmouth so a bit of a mystery that one. Today I was in a fearful mood and sulked to Cromer and back not talking to anyone! No pics but a few sightings. There was a Streetlite on the aforementioned 53's (I think), and something I have never seen before gas bus 110 AU13 FBL was operating to 87 to Poringland all day. Konectbus Trident 504 was on the 8's. I passed the above Versa between Poringlland and Norwich running out of service so probably on way to operate one of the afternoon 84's or 85's. In other news Sanders new ex I.O.M. DAF Lowlanders shoulod be in service soon. I travelled on one of the two remaining tri-axle deckers today for the first time - no idea which one - Orion I think - and loved it - you can really feel the power and very few rattles for a 9yo. 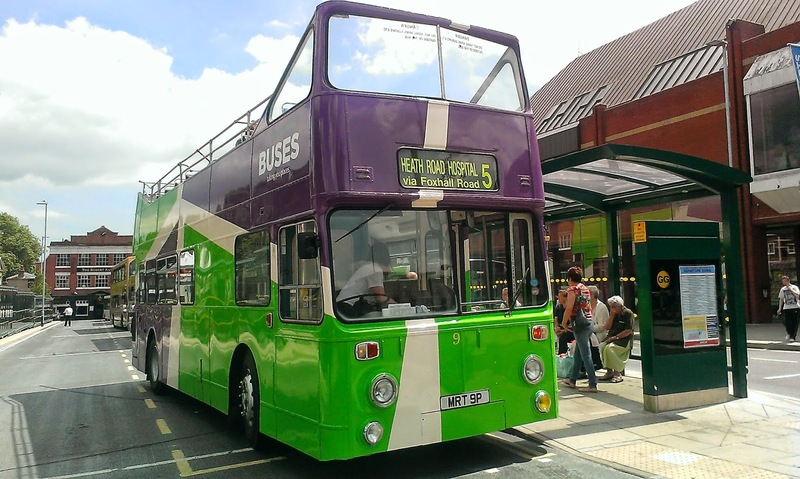 Norfolk Green have got two "new" Dennis Darts in service - a real step free forward that one - and the only thing which might illicit a post from me tomorrow is if, as today, Ipswich Buses have their open top Atlantean running in normal service. It was on the 5/11 today and as it is precisely 11 years since I last went on an Atlantean in service (First's open top Atlantean from Lands End for the record) I won't pass up the chance if it's out again tomorrow. That's about it - I'd just like to say thanks to each and every one of you who have read, contributed, commented, corrected, or encouraged me in the first 7 months of the blog. I can't believe how it has taken off, and who is actually reading it! I'll be back in a few days when batteries and enthusuasm are recharged, but in the meantime if there's anything you think I should know about that needs publicising don't hesitate to let me know. Come on England/Belguim!!! Today's ramble round the North Norfolk coast didn't happen as planned due to the awful weather of this morning. I did end up in Cromer but nothing to report from there. 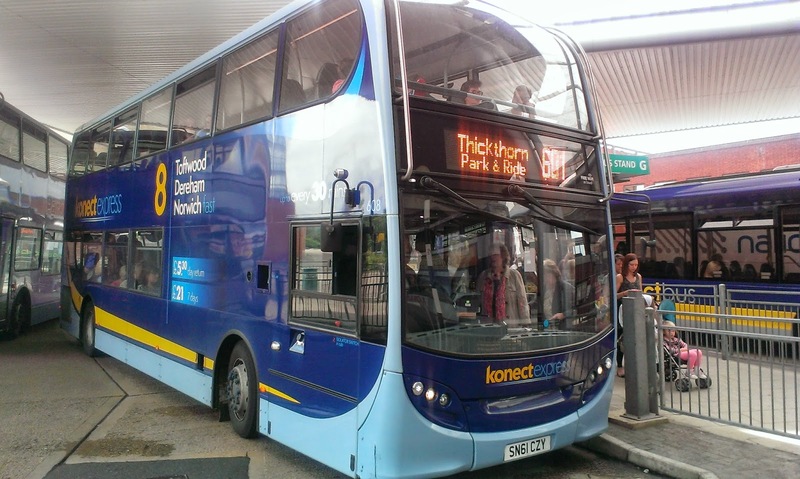 I did, however, get back to Norwich in time to see Konect 8 branded E400 608 on the 601 Park and Ride. So as that's something you don't see everyday I took a pic. Only a quickie tonight. Just when you thought all seven ex Leicester ALX400's had arrived at Yarmouth they go and send one down to Ipswich to cover for the B7's being refurbished. The only real surprise is that they have sent 32061 down - which has the Wilko ad on the back. This means that both 32061 and 32491 will be running arounf Ipswich with Wilko ads and nothing in Lowestoft or Yarmouth. Seems a strange choice. Regarding Ipswich ALX400's 32479 has been chosen to receive the heritage livery. The Post Office red Eastern Counties livery has been chosen and I think it will look pretty good. I did make enquiries as to why 32479 had been chosen when it is not one of the original Ipswich B7's, and was told that firstly they want the first refurbished ALX400 to be in the heritage livery, and that it is all down to MOT dates which is why 32479 is the one. Can't argue with that really! 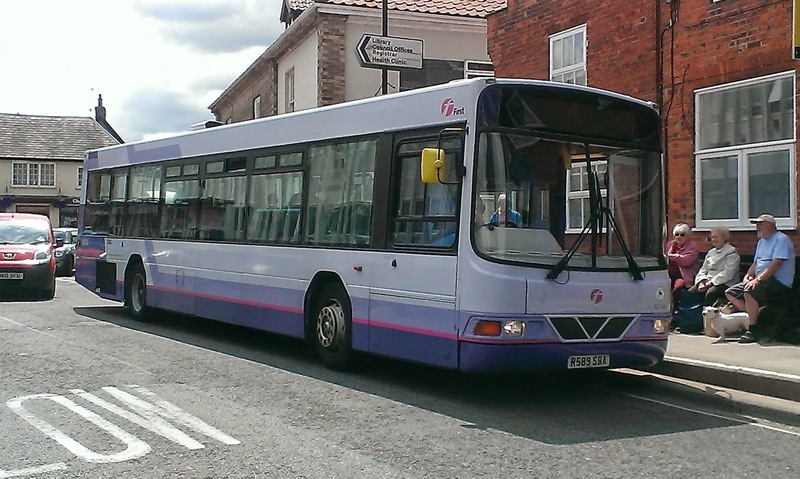 Finally I went on two of Yarmouth's ALX400's today on my first ever trip to Martham, and a very pretty route it is too. I had 32063 going, which I stayed on round the loop at Martham and got off at Hemsby, before walking down to the beach. I thought my luck had really hit gold when I saw 34111 turning in to the Beach terminus, but it was on a school contract so didn't get that. So walked back up to the village and got my first ride on 32058 back to Yarmouth. There really isn't much to choose between those ALX400's, but apart from the hard seats I have nothing against them at all, and they have lasted the distance pretty well. If all goes well a Norfolk Coast Special tomorrow. The trouble with having to use Demand Responsive Transport is that it has to be booked well in advance. The Sizewell coal train is never announced until the night before. Therefore the elements have never combined together for me to be in the right place at the right time. But today it happened as most unusually there was a coal train for Sizewell on a Thursday, and I had a minibus booked from Wickham Market tonight which meant I could get to Leiston to catch the train and still get back to Wickham in time for the minibus. And, of course the weather was decent! That meant a change of plans, performing my good deeds this morning instead of this afternoon, and that change meant I was at Wickham to catch on loan First Yorkshire Volvo B10 Wright Renown 60618 to Ipswich. It was also my bus out of Ipswich to Leiston via Aldeburgh and I took advantage of the layover time in Aldeburgh to get some pretty decent pics of her. The new livery really suits that body, and the seats are a lot nicer than Eastern Counties' other Renowns, although the ubiquitous rattles were more than evident. Excellent for enthusiasts - you can't miss the fleet number. Other companies please note! And so onto Leiston, where after 20 mins my wait was finally over, and as i hoped a Class 20 was leading. I love those 20's. Part of my youth was spent either listening to or travelling on the old Hastings Diesels - their thundering engines were a real sound to behold. Well the Class 20's have the same engines and when I heard it at full throttle pulling away from Leiston Station as was it took me back around 30 years. Wouldn't it be nice if passenger services could be restored on that line. Not to be ignored, as if you could is 37688 on the back of the 20. So as the crossing gates had to be manually opened and locked into place I dashed to a predetermined vantage point on the old platform and took a video of these two beasts as they roared past. Only 28 seconds but 28 seconds I'll watch over and over again. Enjoy. I am pleased to be the first to announce that there is a new blogger in our midst. Rafe Roughton got in touch with me earlier to ask permission to use some of my photos on his Anglian Bus News blog (nothing to do with Anglian Bus company), which naturally I gave. Rafe, like me, lives in the sticks of Suffolk and is going to be concentrating on official news and developments. He seems to have his eye well and truly on the ball as I discovered when I read his blog earlier and found the following news. 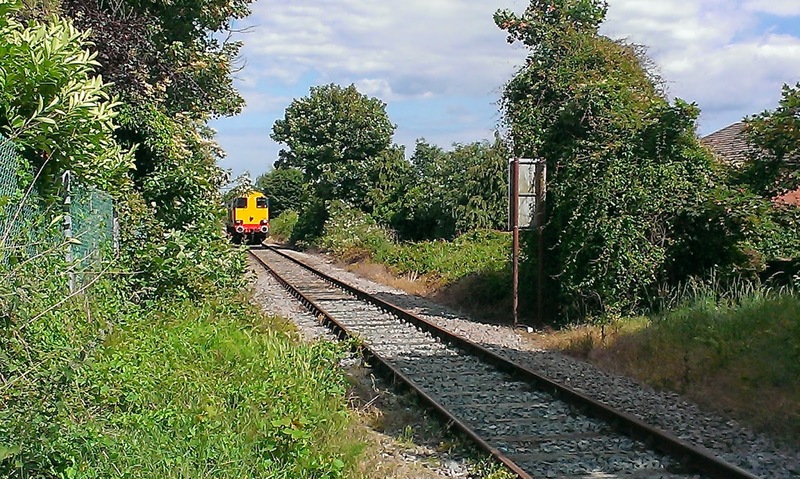 Suffolk County Council have released details of contract 100, which outlines 3 new rural Sunday services to Shotley, Debenham, and finally at long last Woodbridge. You can see the full post with a link to the contract here. Rafe it's good to have another blog on the scene, and I have a feeling you could become a valuable source of information for the rest of us. I have pleasure in adding you to my other blogs links and hope others will do the same. If there's anything I can do to help you get up and running properly, or in any other aspect just let me know. Borderbus have just announced via Twitter that they are starting a new service from Southwold to Norwich via Wrentham and Beccles from Thursday 24th July. More details are to follow but if this is a school holiday only service to stop the Tridents gathering dust, or a permanent service remains to be seen. As soon as I know more I'll let you know. Borderbus have just responded to my question on Twitter confirming that the new service, numbered 146 (where have I heard that before!!) WILL be an all year round hourly service. I can't wait to find out more! Thanks to Borderbus for replying. I have also been informed that Borerbus will NOT be using the Tridents - so the plot thickens!! Here is the VOSA application. Other Details: Monday to Saturday excluding bank holidays. Hourly service. 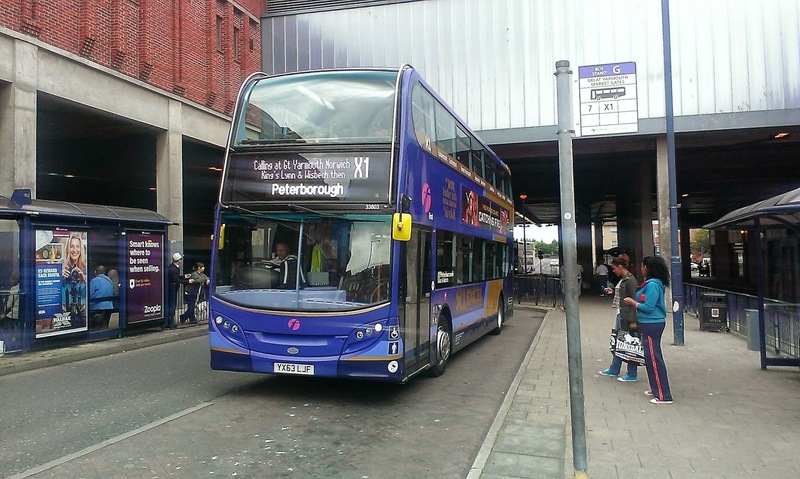 Various blogs have announced details of the split of the X1 at Norwich, and the disruption for through passengers this willl cause, with a 30 min frequency between Norwich and Peterborough, and a reduced 20 min frequncy between Norwich and Yarmouth, although now all journeys will extend to Lowestoft. However what I can reveal is that between Yarmouth and Lowestoft the X1 will observe ALL stops on the route. That will mean that, as now, there is very little difference between the various routes between Lowestoft and Yarmouth, with the X1/1/1A and 7 all taking roughly the same time. 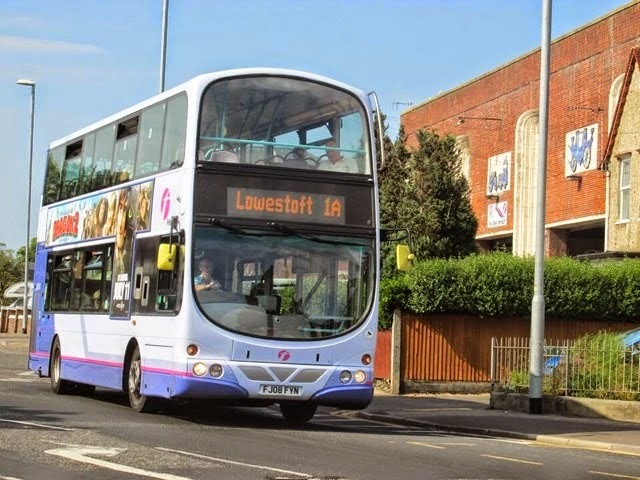 It will also mean that vehicles other than E400's will be on the X1 as 7 E400's is nowhere near what a 20 min frequency between Lowestoft and Norwich will need. Now are you all sitting down? Sure? Not holding a drink? Good. I travelled on an X1 E400 today. It was 33803, the one that has given First a lot of grief since it arrived. Well no more. Apart from an annoying creak by the front nearside top deck window - definitely a creak not a rattle - it was by far the quitest ride I've ever had on one of them. No rattles. I repeat NO RATTLES. Even the driver seemed gobsmacked. I have no idea what First have done to it but if they are doing it to all the fleet no one will be happier than me to shout it from the rooftops. Well done - for the moment 33803 is a great bus. That's the good news about First. What I saw earlier in Lowestoft today did them no favours whatsoever. First staff were literally pulling customers away from Anglian's stop, thrusting timetables into their hand and "encouraging" them to get on the 99. They sounded like market traders flogging bowls of lemons. Anglian responded this afternoon with a tweet advising customers not to "accept any inferior imitations" to the 61, which I thought was quite restrained. I can't believe for a second senior management at First sanctioned what I saw today, but if they did they should note I heard the word "unprofessional" muttered by many customers while queueing for the X1. Before that I had the pleasure of meeting Robert Collins, who has contributed to this site in the past, and who I took a pic of last week in the rain at Pakefield driving the 99's. Unbeknown to me it was not the first pic I had taken of Rob as he told me about his claim to fame while driving for Anglian. 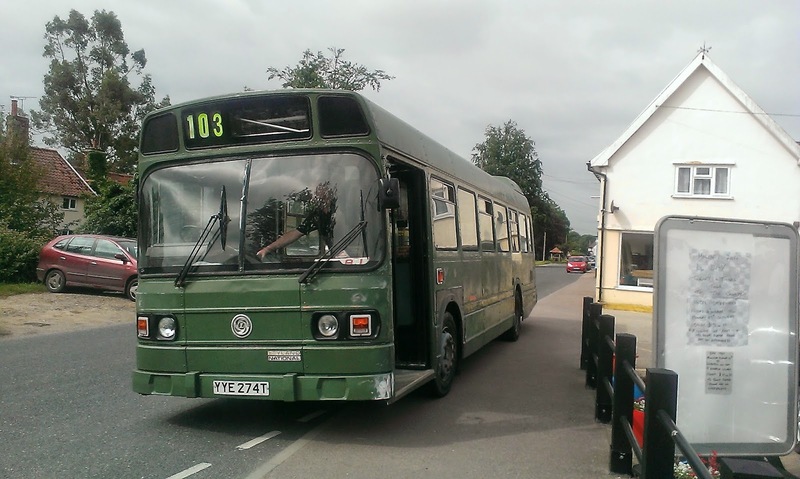 He was the one and only driver to ever take a gas bus on the 164's in its 6 months of operation, and I just happened to be walking to the church for a funeral when he pulled in at Wickham Market,and very annoyed I was as I couldn't jump on it to go to Sax! Really good to meet you and the perfect opportunity to post that pic I took of you and the gas bus in Wickham Market last year. Finally tonight i got my Olympian fix today with 34108 on the 1320 to belton. A great ride, great bus and so pleased they are still going. Also saw 34111 on the 8's. Today I went to foreign climes and unknown territories. My day went Halesworth - Bungay - Diss - Bury - Thetford - Watton - Norwich - Halesworth. Everything ran on time, and I can't remember travelling so much and not getting one double decker - not even on the 3 between Watton and Norwich! However for this post I'll concentrate on a company whose vehicles I travelled on for the first time today - Coach Services of Thetford. 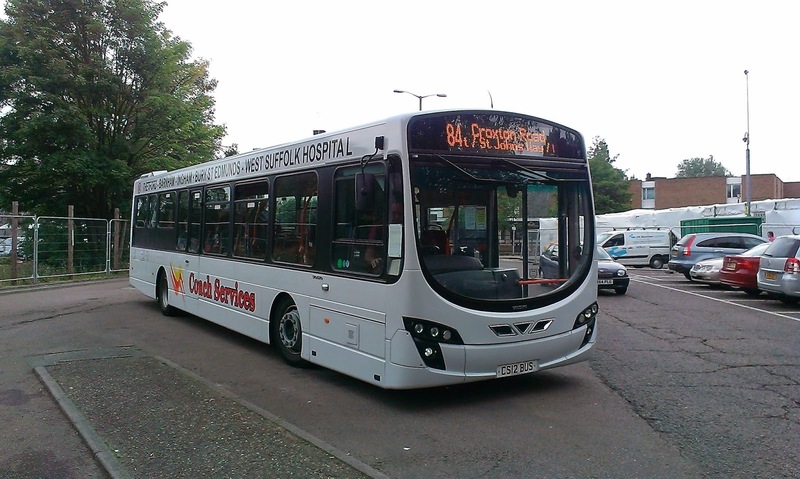 In the last three years Coach Services have developed from, well, a coach operator into having a virtual monopoly on bus services in Thetford, including 3 different routes to Bury St Edmunds, and routes to Mildenhall, Kings Lynn and Watton in addition to local Thetford town routes. 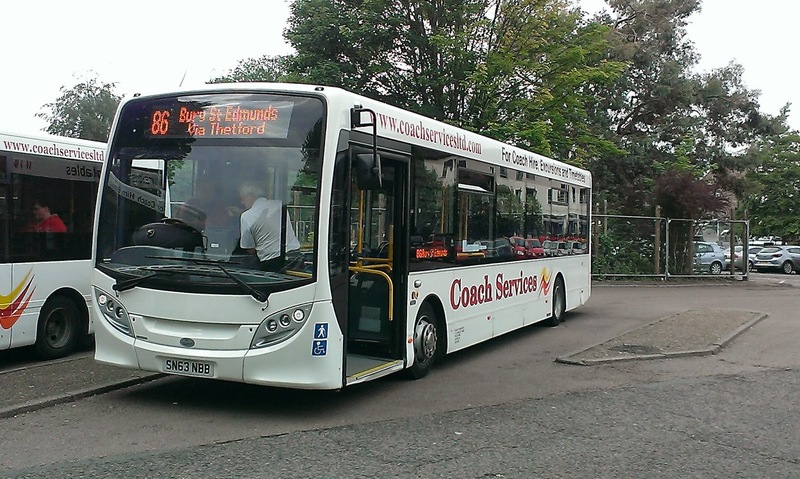 All their bus services are operated by low floor vehicles, mainly single deckers, including some brand new E200's. They have a very informative website, including a comprehensice fleet list. You can access the website here. 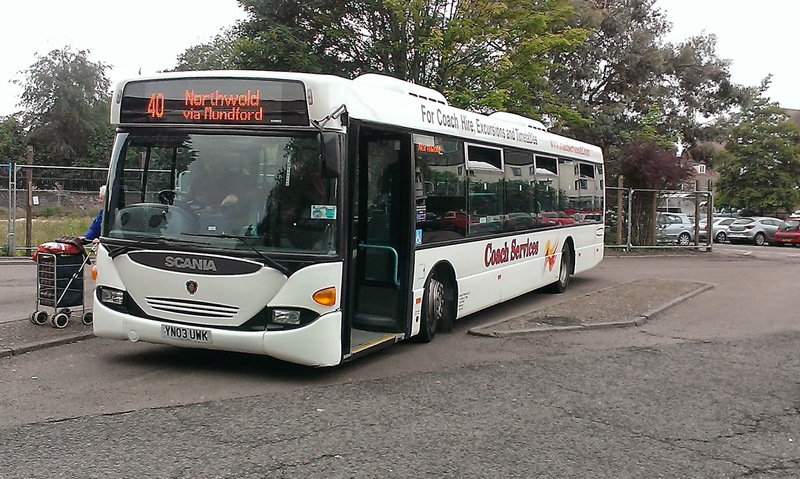 Today I travelled from Bury to Thetford on the 84, which was operated by a Volvo B7rle with Wright Eclipse body and the great registration CS12 BUS. A decent route and decent ride, altough as usual with new buses a bit too rattly for its age. Btw Coach Services don't have fleet numbers. After spending a rather good 40 mins at Thetford Bus Station which is very picturesque in the direction behind the camera I then caught one of the new E200's to Watton. Again a really nice route and it was one of the better E200's I have been on although the usual ridiculous rattling for a brand new bus was evident. One day bus companies will take a stand and say enough is enough and a brand new bus shouldn't be that noisy. I won't hold my breath. 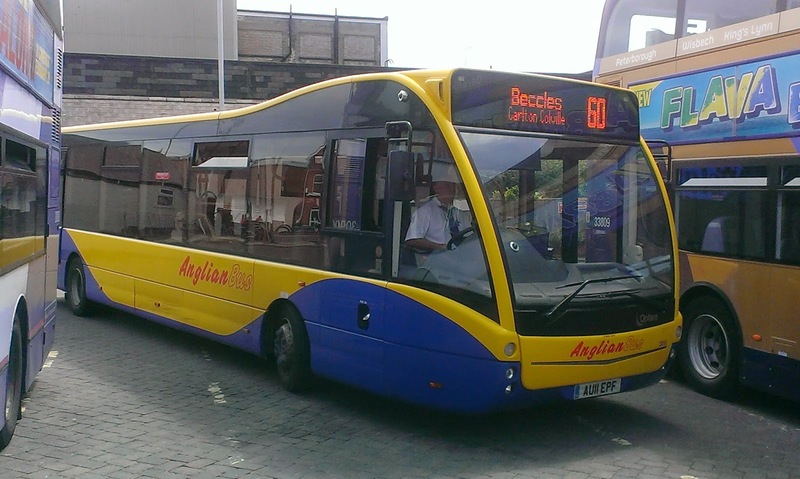 However it is not the fault of Coach Services that I have an issue with all things Alexander Dennis, and I was impressed with their routes, the friendliness of the drivers and the cleanliness of the buses. I will definitely return to sample their other routes. Here are a few more of their vehicles. I'll be updating Flickr in the next couple of days where many more pics from today will be going up. Finally thanks to Beestons who became the first operating company to follow me on Twitter. Thanks guys, I hope to do a big feature on you in the near future. No not Norwich City strikers but my day yesterday spent in the company of Harry from Norfolk Scene Blog. We met in Yarmouth with no fixed agenda but hopes were Olympians and the Short Set. No joys on Olympians in Yarmouth so we decided to go to Norwich. We were just passing Yarmouth Station on 37578 - whose ticket machine is rather cruelly declaring it's 34108 - when Harry spotted the Short Set in Yarmouth Station. A DMU had failed at Reedham and so it was out to play. So on arrival at Norwich an extremely brisk walk to the station to see what it was on next was called for as tweets and emails to various groups drew a blank. The answer - nothing!! That was it for the short set for the day but my word we got a great photo opportunity and saw it leave the station to reverse back into the sidings. I took the oppportunity to take a video. 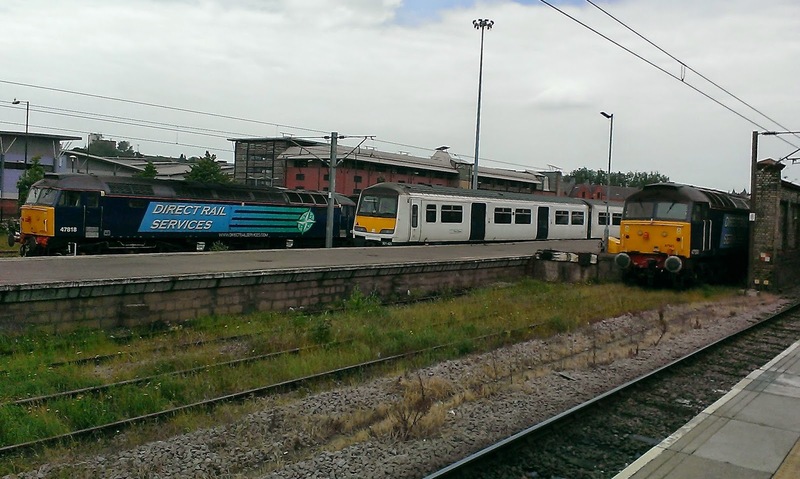 Also of interest yesterda\y was the appearance of a 4-car 321 EMU which are not usually stored at Norwich. Another class 47 - 47 501 was also poking its nose out so some good pictures were assured. Here are a selection. So after not getting on the short set we headed back to the bus station aiming to get the X2 to Pakefield before sampling the 99, which Harry hadn't done yet. We were tempted with 33423 on the X1 but I said the only thing that would change our plans would be an Olympian on the X1. After a very long wait for the X2, which turned into a double load we left Norwich..........and immediately passed 34108 on the X1. Not amused!! So we got to Pakefield caught a noisy 30901 to Morrison's and after a little shopping were vibrated and shaken around Kessingland on 44113. We had both buses virtually to ourselves, the most being 3 passengers including us. I parted from Harry at Lowestoft and I think I had the better deal going home - a nice comfy gas bus as opposed to Harry's President! A great day despite the near misses, and my thanks go to Harry for his company in what can sometimes be a pretty lonely hobby. We must do it again sometime.